Rêve Academy is a Minneapolis based organization with a mission to help kids dream with direction through pathways to digital careers. 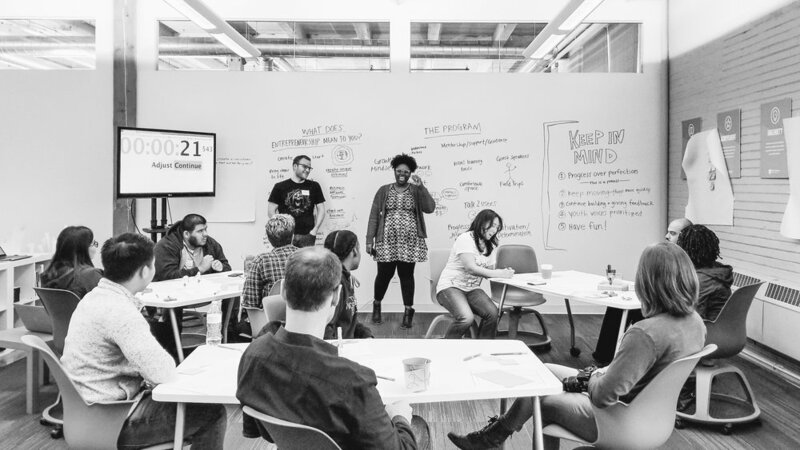 Reve is developing curriculum for a new entrepreneurship program and is looking for a strategic way to incorporate student voices in the planning process. The involvement of students in the development of the program is not only a value of Reve Academy, but also a requirement for an education grant. In order to create a system in which students are engaged and their voices empowered in a way that can be shared with donors and staff, our team developed an e-book with curriculum suggestions and a design thinking workshop template, as well as a digital platform called Reve Voices. These tools will not only help Reve Academy implement student feedback in the planning and development of the entrepreneurship program, but can also be applied to other programs at Reve in the future. We conducted a competitive audit to see how other organizations incorporate student feedback into program planning. Our team spoke with students, teachers, staff, and entrepreneurs to gain further insight on students’ interests, learning & teaching styles, and how to strengthen Reve programs. Our workshop facilitated rapid ideation and prototyping led by students to understand students' knowledge of entrepreneurship and expectations for the program. Real-time whiteboard sketches of findings from the workshop. The Reve Voices digital platform allows instructors to plan programs that collect and implement student feedback in a way that can easily be passed down and run by student leaders. This iteration of the platform focuses on the upcoming entrepreneurship program, however, it can also be used for other programs at Reve Academy. Hand drawn sketches for the user flow of the Instructor view of the platform. Click play to watch a a video walkthrough of the platform. The Reve Voices digital platform prototype needs to be tested on instructors and students to asses what works and areas of improvement. Once the platform is built out, it is suggested to observe the tool in use by both instructors and students to see how it is used and other environmental factors influence its use. Our team with Wade, Ibro and Mandy - our clients at Reve Academy.